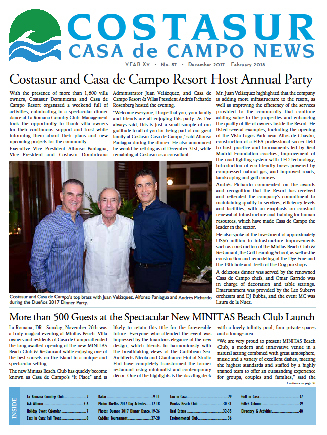 As published by partner Alfredo Guzmán in Costasur Casa de Campo News, No. 57 (December 2017 – February 2018), page 29. -Payments for jewelry above RD$450,000 (~US$9,390). Given the above, in order to register any operation involving amounts exceeding these limits purchasers must now file evidence of payment through a non-cash method at the related rentity (i.e., Registrar of Title for real estate purchases, Chamber of Commerce for share transfers, and DGII for motor vehicles). The Decree also expressly prohibits real estate Registrars from requesting additional information such as client due diligence, source of funds, etc., when it states that they would only be authorized to request proof of the non-cash method of payment in order to proceed with the operation’s registration. Approved methods of non-cash payment may include: copies of the check or other legal non-cash method of payment, wire transfer (either national or international), deposit slip made at the seller’s bank account and credit or debit card payment receipt. Identity of anyone who is the ultimate beneficiary of more than 20% direct or indirect ownership of the given structure. If the direct or indirect ownership chain cannot be established, the person exercising legal or effective control over the structure will be considered its ultimate beneficiary; if neither of these can be established the structure’s top management officer will be deemed as the beneficiary. Any changes altering the ultimate beneficiary structure must be reported within 6 months. As mentioned in the prior issue, the new law includes an extensive list of 30+ crimes, including all tax offences contained in our Tax Code, which it has classified as predicate offences for money laundering (predicate offences are those whose proceeds may become the subject prosecution under our anti-money laundering statute). Now, according to our current Tax Code, any tax offence voluntary or otherwise, involving overdue taxes in the amount of approximately US$2,800. In the newly-released regulation, the government found a middle ground with the business community agreeing to classify tax offences as predicate offences for money laundering only when the amount involved surpasses 700 minimum salaries (roughly US$137,000), per fiscal year. The benefit of this new threshold will not apply if the person has already received a warning or been given notice by the Tax Office. On a final note of direct relevance to Casa owners, all non-financial parties subject to reporting according to the law, specifically attorneys, brokers and accountants, to name a few, now have to adapt their procedures to meet with the law’s current due diligence, compliance and know-your-client procedures, while they wait for the approval of sector-specific regulations. 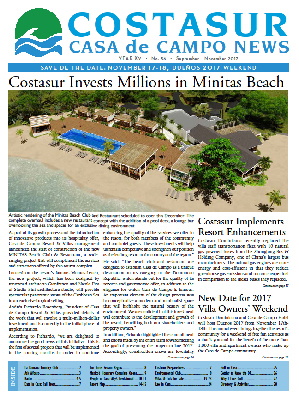 This includes Costasur, whose top management has confirmed us that they have already retained external advisors to help them adapt their departments to the new law, including the team at Casa de Campo Real Estate, which will be able to offer their clients, be it sellers or buyers, the certainty that their operations will be handled in full compliance with the new statute. As published by partner Alfredo Guzmán in Costasur Casa de Campo News, No. 56 (September – November 2017), page 24. On June 1st 2017, Dominican nationals and residents woke up subject to a new Money Laundering framework. Law No. 155-17 replaced outdated money laundering statute No. 72-02, which had been enacted with a main focus on money laundering derived from illegal drug-related activities. The executive and legislative branches pushed for the approval of this new statute in record time during the first half of 2017, following guidance from The Financial Action Task Force of Latin America (GAFILAT), a G-7 regional organization. Non-adherence to said general guidelines by Fall 2017 could have caused the country to be blacklisted and seen its access to major international capital markets-which the D.R. has grown very fond of in the past few years-closed. Payments for real estate above RD$1,000,000. Payments for motor vehicles above RD$500,000. Payments for jewellry above RD$450,000. Payments for corporate share transfers above RD$250,000. One major change for the real estate market brought by this new law, is that now, regardless of the amount involved, Registrar of Titles are requiring buyers to also file evidence of payment through a non-cash method in order to process their title conveyances. Not complying with this new requirement, will mean that their conveyance will be rejected and title will remain in their seller’s name, with all the risks that entails. So, if for example, purchase price payment for a US$400,000 villa is made through an international wire transfer, the Registrar of Titles will be requiring the buyer to deposit his bank’s wire or swift confirmation for this exact amount and the wire’s full details. Before this new law, the parties would limit themselves to mentioning the price in the signed deed of sale and that said price had been paid in its entirety without any further details. Similar procedures have been set up at the Tax Office (DGII) for motor vehicle title transfers and at Chambers of Commerce for corporate share transfers. These new filing requirements are already causing increased uncertainty within the real estate and legal industry as the law is too vague as to what exactly these registries are allowed to require as evidence of payment. The Presidency’s Legal Advisory Office is already working on the new law’s application ruling which is expected to address and clarify these uncertainties. Another major change pertains to the number of parties which are now subject to reporting activities derived from money laundering preceeding infractions. Before this law only financial institutions were considered as subject reporting parties. The new statute now includes a list of non-financial subject parties, such as real estate brokers, casinos, attorneys, notary publics, accountants, which will now have to establish new money laundering due diligence and know-your-client procedures, report any irregular activities, all in accordance to the law’s new compliance and reporting requirements. Financial crimes, Bribery, Cross-border bribery, extortion, tax evasion and other tax-related infractions, insider trading and use of privileged or confidential information, market manipulation, hi-tech crimes, infractions committed by public officials, environmental infractions, unjustified enrichment, and any other criminal infraction subject to a prison term of 3 years and above. Guzmán Ariza is pleased to offer this legal guide to international investors and law firms interested in the business opportunities present in the Dominican Republic. The guide provides basic information about the country and its legal system. You may download it here.